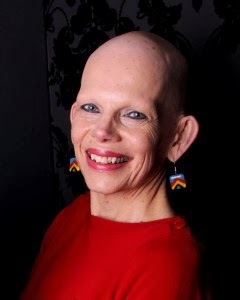 ALOPECIA UK are delighted to announce children’s author Sue Hampton as an ambassador for the charity. Sue has lived with alopecia totalis for over thirty years. She has written 18 novels for 6 – 16 plus including one book in particular, ‘The Waterhouse Girl’, which draws on her own experiences with alopecia. The book has been praised by world famous author Michael Morpurgo (author of ‘War Horse’) saying it was “beautifully written”. If you would like to read more about the work of Sue Hampton, see how to obtain a copy of her books or even see how to go about getting a school to arrange a visit for Sue to do a workshop please have a look at her website. Sue Hampton is the author of 'Pomp and Circumstances' and 'Aliens and Angels: Three Stories For Christmas'.